To stop selecting, close this box. Lot lines are approximate. Not for legal use. To measure, select the area or distance measure tool. To stop measuring and clear the results, de-select the tool by clicking it again. 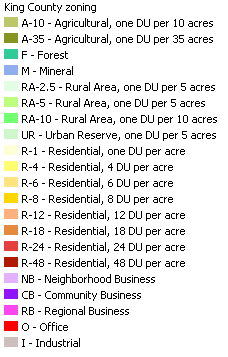 Want to know what the zoning codes mean? Build a list of selected parcels, then export selected data. DISCLAIMER: The information included on this map has been compiled by King County staff from a variety of sources and is subject to change without notice. King County makes no representations or warranties, express or implied, as to accuracy, completeness, timeliness, or rights to the use of such information. This document is not intended for use as a survey product. King County shall not be liable for any general, special, indirect, incidental, or consequential damages including, but not limited to, lost revenues or lost profits resulting from the use or misuse of the information contained on this map. Any sale of this map or information on this map is prohibited except by written permission of King County.